This year, the weather decided to play its April Fool's trick at the end of the month. The meteorological highlight of April was the rapid warming that occurred at month's end, especially at the coast and in western areas. 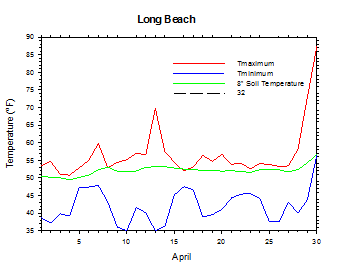 Long Beach's high temperature soared from 58 degrees on the 28th to 88 degrees on the 30th. This value shattered their previous April record maximum temperature by 12 degrees. It is worth noting that the maximum temperature recorded at Long Beach during all of last summer was only 75 degrees! The last time Long Beach was this warm was September of 2012. The abnormal warmth is a testament to how important offshore flow is to achieving hot coastal temperatures. In addition to the presence of a warm air mass, it is critical to negate the cooling effect of the ocean in order for the beaches to reach their maximum temperature potential. Elsewhere, April was a typically changeable yet largely unremarkable spring month that featured little in the way of sudden pattern shifts. There were active and relatively calmer periods of weather, along with warm and cool spells, but a notable absence of dramatic meteorological events until the very end. Rain fell across nearly the entire state on the 22nd, as Ellisforde (in Okanogan County) reported 0.68 inches. In fact, even the normally arid central areas received some wet weather. Storm total rainfall of 0.73 inches was observed at Moxee East during the overnight period of the 21st and into the early morning of the 22nd. 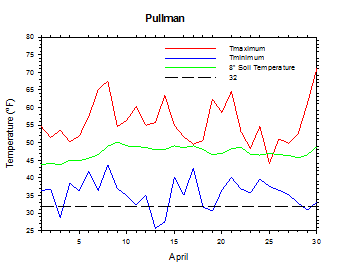 Notable temperature extremes for the month include 81 degrees at the Tri-Cities on April 8th, and 27 degrees at Davenport on the 28th. 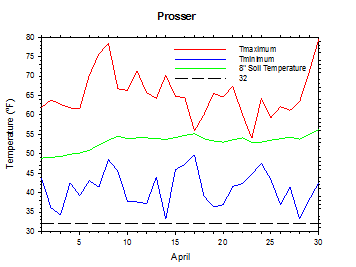 Overall, Prosser's mean temperature was 1.9 degrees above average, which makes this April the warmest since 2000. The month began with 0.62 inches of rain falling on April 1st at Underwood. High temperatures across the state reached the upper 40s to mid 60s, following morning lows in the 30s to around 50 degrees. 0.48 inches of rain fell at Poulsbo South on the 3rd, and gusty south winds were observed in eastern areas. After lows in the 30s and 40s, highs on the 4th reached the upper 40s to mid 60s. Rain fell in parts of western and eastern Washington, though central Washington was mainly dry. 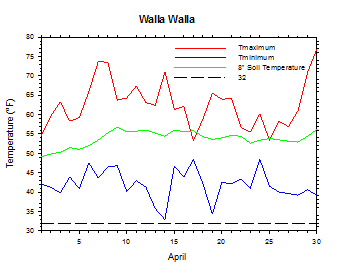 The 7th was very warm and dry, with highs ranging from 60 degrees at the coast to 79 degrees at Wallula. Breezy and cooler weather came in later on the 8th and into the 9th. Highs on the 8th reached 81 degrees at Tri-Cities, but only 53 degrees at Long Beach, while lows varied from the 57 degrees at Badger Canyon to 32 degrees at Broadview. Highs on April 9th were generally in the upper 50s and 60s, with lows in the mid 30s to around 50 degrees. High temperatures on the 10th peaked at around 70 degrees in central areas, but only in the mid to upper 50s elsewhere. Light southwesterly winds continued, with mostly sunny skies in the east. High temperatures on the 13th varied from the 50s in eastern border areas to the low 70s in parts of the west, including at the coast. Lows were in the upper 20s to 40s. Lows on the 14th were as cold as 22 degrees at Broadview, although highs climbed into the upper 50s to low 70s. Highs on April 16th ranged from 46 degrees at Green Bluff to the 60s in central areas, while lows were in the 30s in the eastern border area, and 40s to low 50s elsewhere. Highs on the 17th were relatively cool due to clouds and rain, and ranged from the upper 40s to mid 60s. Winds gusted to over 35 mph as a front moved through the state, and 1.18 inches of rain fell at Montesano. Much of western Washington received a half-inch or more of rain, while some eastern areas received one quarter to one half-inch. The 18th was mainly dry, and then another storm transited the region on the 19th. Highs on the 19th reached the mid 50s to low 70s, with lows in the mid 20s to 40s. Rain fell in southwestern areas, including 0.57 inches at Long Beach. Highs on Easter Sunday were in the mid 50s to 60s, with lows in the 30s and 40s. Highs on April 21st reached the mid 50s (coast) to low 70s (south central areas), with lows in the mid 30s to 40s. Late in the evening, up to one-half inch of rain fell in parts of the Yakima Valley. More rain fell into the early part of the 22nd, with central areas picking up the brunt of the totals for a change. St. Andrews received nearly 0.5 inches. Highs on the 22nd reached the 50s to mid 60s, with lows in the 30s and 40s. Rain again fell in many parts of the state on the 23rd, including in south central areas, with around 0.3 inches in the Prosser area. The heaviest rain occurred in southwestern areas, as 1.86 inches was recorded at Stevenson. Highs on April 24th reached the 50s and 60s, with lows in the upper 30s to low 50s. More than one inch of rain fell in much of Whatcom County. Highs on the 25th ranged from the mid 40s to the mid 60s, with lows in the mid 30s to mid 40s. Rain fell in southwestern parts of Washington, including 0.79 inches at Tokeland. Similar temperatures occurred on the 27th, with 0.78 inches of rain at Underwood. The morning of the 28th was chilly, and lows were as cold as 27 degrees at Davenport. However, a nice recovery was observed by afternoon, with highs ranging from the 50s in the eastern border areas to the upper 50s to 60s elsewhere. 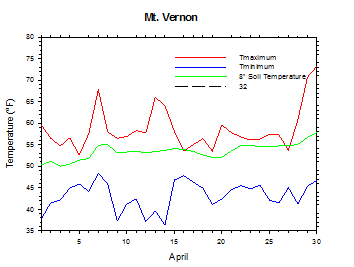 Though a few areas dropped below freezing on the morning of April 29th, most areas were very warm later in the day. Highs were in the mid to upper 70s in many western areas, which was well above average for the date. The 30th was an even warmer day, with highs in the 70s and 80s, including 88 degrees at Long Beach. Lows were as warm as the mid to upper 50s at the coast. 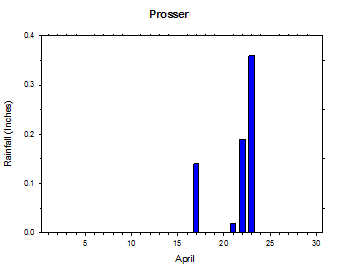 The average April temperature at Prosser (WSU IAREC) was 53.6°F, which is 1.9 degrees above average. The average high temperature was 65.3°F, which is 1.8 degrees above average. The average low temperature was 41.0°F, which is 2.3 degrees (1 standard deviation) above average, and the warmest since 1994. The maximum temperature recorded last month was 79.6°F on April 30th, while the coolest daily high was 54.0°F on April 23rd. 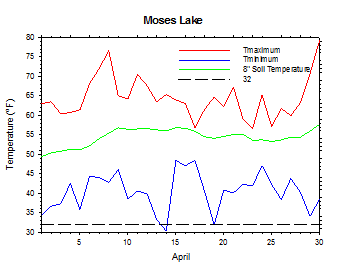 Low temperatures ranged from 49.7°F on April 17th to 33.2°F on April 28th. Daily average temperatures ranged from 63.0°F on the 8th to 49.3°F on the 23rd. The monthly precipitation total was 0.71 inches. 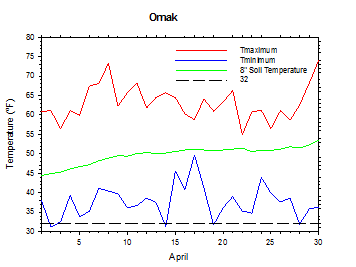 The average wind speed was 5.8 mph, and the average 8 inch soil temperature was 53.1°F. 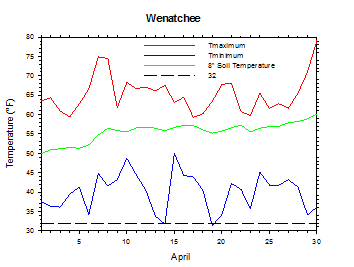 Wenatchee (WSU TFREC) recorded an average temperature of 53.3°F, which is 1.7 degrees above average, while Walla Walla's average monthly temperature of 52.1°F was 0.8 degrees above average. April 5th: 0.9 inches of rain fell at Stevenson. 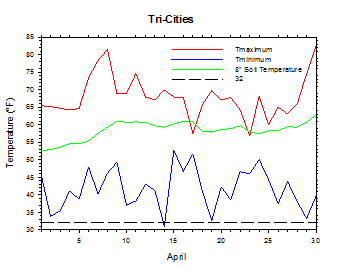 April 8th: The high temperature at the Tri-Cities reached 81 degrees. April 14th: The low temperature at Broadview plunged to 22 degrees. April 23rd: 1.86 inches of rain fell at Stevenson. April 28th: The low temperature at Davenport fell to 27 degrees. 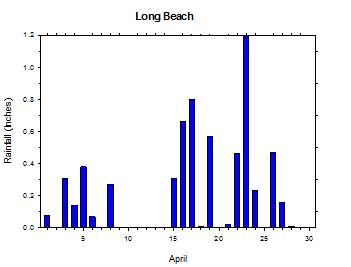 April 30th: The temperature at Long Beach soared to 88 degrees. Crops bloomed to life across the state in early April, as bee hives were moved into tree fruit orchards for pollination. During the third week of the month, cultivation of hops occurred, and pollination conditions were generally good. Winter wheat appeared to be in good shape, while some spring wheat was beginning to emerge. As of late April, most of the fruit trees in warmer areas were in late or post petal fall, while in cooler areas, cherries were at petal fall while apples were at full bloom. 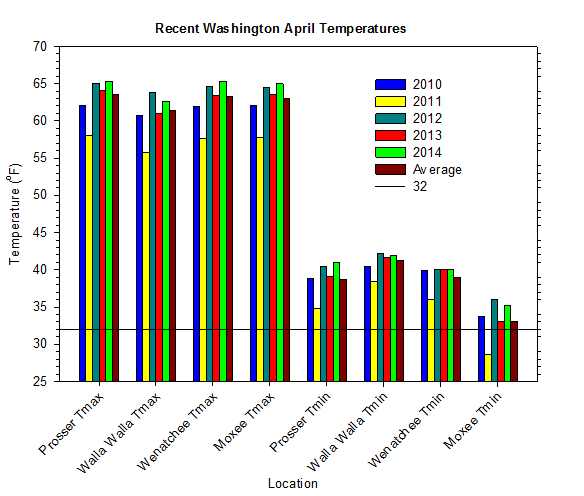 Asparagus harvest was also picking up in late April, while spring wheat seeding was nearing completion in Whitman County (National Agricultural Statistics Service). 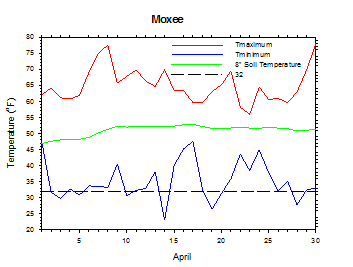 On April 22, 2012, the temperature at Moxee soared to a monthly record high of 88 degrees. According to the Climate Prediction Center, above average temperatures are likely during May, especially in western areas of Washington, along with above average precipitation. The signal for above average temperatures in Washington generally continues for the next 12 months, with the strongest likelihood for anomalous warmth occurring in the late summer and early autumn. The odds are tilted toward below average rainfall for early to mid summer, with no clear indications thereafter. El Niño conditions will likely begin to develop shortly, and should be fully established by later in the summer.